A Breakfast with Santa event is not only fun for children, but it can also raise funds for a favorite charity. The planning for such an event requires the formulation of a budget, creating and selling tickets, marketing, recruiting volunteers, selecting and preparing for activities for the children, preparing food or choosing a caterer, purchasing gifts and securing a location and a Santa. To accomplish all of these tasks, a well-organized team can distribute the labor and share the responsibilities. Organize a team of people to help plan and conduct the event. Pick three to five people who are willing to volunteer their time. Select a charity. You may want to choose a charity that helps underprivileged children. Several of these types of charities operate in numerous states, including KaBOOM!, Locks of Love, Communities in Schools, March of Dimes and Make-a-Wish Foundation. Select a location for the event. If you decide to make the food yourself, you and your team can check the availability of spaces in local churches and community centers. The other option is to check local restaurants, cafes and hotels. Given that it is a charitable event, these establishments may want to pitch in their services. Once you find a location, decide on the date and time. With date, time and location in hand, you and your team can spread the word, find a Santa and a photographer, and start selling tickets. An effective way to market the event is to create your own Facebook page. You can input the relevant information and invite your Facebook friends with a few mouse clicks. The old-fashioned way is to create flyers and hand them out at local stores, schools, churches, libraries and bookstores. Also contact local newspapers to post information about the event. Some will typically advertise your Breakfast with Santa for free. You and your team can make the tickets by hand or use a drawing program on a computer and print them out. You can also purchase a roll of tickets at a stationery store or order ready-made tickets over the Internet. Although the hub of activity will be Santa and the food, you and your team may find a crowd at the door when the event begins. 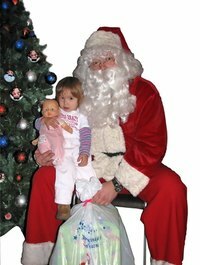 You will need to keep the children entertained while they wait for their time with Santa. Choose two or three activities that will keep the children occupied. Examples of activities include bubble-blowing, finger painting and story-telling.